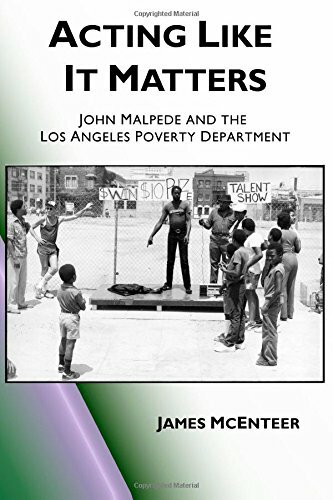 James McEnteer’s “Acting Like it Matters: John Malpede and the Los Angeles Poverty Department” is a complex study of an acting company made up mostly of L.A.’s Skid Row residents. With the company serving as the book’s hub, there are spokes radiating outwards to the political and social structures that put this remarkable story into context. If William Blake saw the World in a Grain of Sand, James McEnteer sees the broader problems of gentrification, police state harassment of the poor, CIA complicity with illegal drug trafficking, and the crisis of the health system as topics worthy of dramatizing by those who are its victims, the dwellers of one of the United States’ most infamous “left out” neighborhoods, but a place that despite its sorry appearance was a real estate investor’s dream. As a New Yorker, I could not help but notice the resonances with my own city where the poor and the homeless confront the same daunting odds. McEnteer mentions in passing that Henrietta Brouwers, the companion and artistic partner of John Malpede, studied under Augusto Boal, the Brazilian director who founded the Theater of the Oppressed. As it turns out, Boal was a permanent fixture of the Brecht Forum in New York until his death. It was there that he operated “a rehearsal theater designed for people who want to learn ways of fighting back against oppression in their daily lives” in the same way that Malpede’s LAPD functioned in Los Angeles. Just six years after Boal’s passing, the Brecht Forum shut down because it could no longer afford to pay the exorbitant rents that the real estate market dictated.